On Tuesday 25 September 2018, the Sustainable Development Goals (SDGs) will celebrate their third anniversary and all around the world people will be paying attention to the Global Goals. This initiative is called ‘The Global Day of Action’, because: everyone can contribute to achieving the Sustainable Development Goals (SDGs) in 2030! The SDGs are 17 global goals for positive change, aimed at meeting the greatest challenges of our time. That sounds big, but starts small in every community: with ideas and initiatives from people and local institutions, organizations and companies. 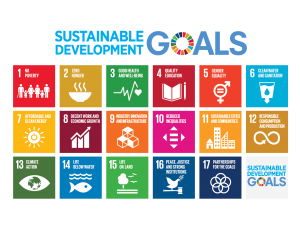 For example, together with CNME, we will organize a class on the SDGs in every school in Maastricht, in the week of 24 September (the same week as “The Week of the Green Footsteps”). Schools can use the SDG campaign “The World’s Largest Lesson”, with a lot of inspiring teaching material. But there will be many more activities in Maastricht! Join us! We invite the Maastricht municipality, citizens, businesses, restaurants, schools, institutes and organizations to join us on September 25 during the Global Day of Action for the SDGs. Do you also want to put Maastricht on the map as a sustainable city? Do you have inspiring ideas and do you want to take action? Let us know!